There's a new sport coming to the 2020 Summer Olympics in Tokyo: 3-on-3 basketball. While NBA stars likely won't play, here's what the tournament could look like if they did. There's a new sport coming to the 2020 Summer Olympics in Tokyo: 3-on-3 basketball. After confirming its addition to the program on Friday, Olympic officials are hoping this version of the game results in better competition than the last few U.S.-dominated tournaments. The 3-on-3 games will be played on a half-court in an attempt to make them more akin to street ball — except rules won't be self-enforced and, no, there won't be chain nets. If the IOC uses rules similar to those in FIBA's 3x3 tournament, the winner will be the first team to reach 21 points, or whoever is leading after 10 minutes. They'll count by ones and twos, meaning long-distance shooting will likely be prioritized (and Steph Curry could probably win the tournament on his own). 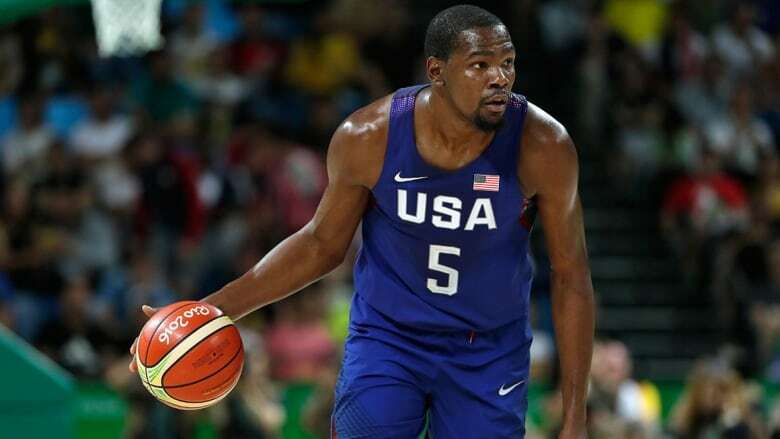 Unlike the five-on-five Olympic tournament, it's doubtful that NBA stars will want, or be allowed, to participate. In fact, the IOC may want to use this event as more of an amateur showcase. But that can't stop us from wondering what a dream 3-on-3 Olympic tournament with NBA players might look like. Here's a look at who the eight 2016 qualifiers, plus Canada and Greece, should put on their rosters. Curry, Kevin Durant, Kawhi Leonard. Despite his unique skills, LeBron James doesn't hit threes well enough to make this team. James Harden and Russell Westbrook are good scorers, but also too ball-dominant for a team that already has Curry and Durant. Thus, Leonard gets on — he's the best perimeter defender in the NBA, he hits 39 per cent of his long-distance shots, and he's comfortable playing off the ball. The U.S. talent pool is so deep that the 10th-best American team is probably still the gold-medal favourite in this tournament. Patty Mills, Matthew Dellavedova, Joe Ingles. Andrew Bogut is the toughest cut here, though he remains sidelined with a knee injury. Kyrie Irving holds Australian citizenship, but he plays for the U.S. Maybe he can be convinced to switch allegiances for three-on-three. If he can't, the two-point-guard look combined with the smooth-shooting Ingles could make some noise for Australia, which finished fourth in Rio. Jonas Valanciunas, Domantas Sabonis, Mantas Kalnietis. Knicks forward Mindaugus Kuzminskas gets left off in favour of national-team veteran point guard Kalnietis. Lithuania looks slow, but may be able to rely on Valanciunas's scoring at the rim along with Sabonis's passing and Kalnietis as the floor general. Dario Saric, Bojan Bogdanovic, Ivica Zubac. Sixers rookie Saric would be the nominal point guard here, with Bogdanovic hanging out behind the arc and Zubac, a Lakers first-round pick last year, cleaning up the glass. Croatia has sneaky potential. Nikola Jokic, Boban Marjanovic, Milos Teodosic. Serbia is my favourite to challenge the U.S. They won silver in Rio, and bring with them the NBA's best passing big in Jokic, a 7-foot-3 monster in Boban, and the player voted by NBA coaches as the most talented outside the NBA in Teodosic. This team would have a chance to exact revenge against the U.S. for the title-game loss in 2016. Marc Gasol, Serge Ibaka, Ricky Rubio. The Spaniards have talent, but lack athleticism. Gasol would be the centre of the offence with a pass-but-can't-shoot guard in Rubio and a shoot-but-can't-pass forward in Ibaka. If Gasol can carry the offence, Spain's defence could be enough to keep them in every game. Rudy Gobert, Nic Batum, Tony Parker. This is an extremely solid team. Gobert would be a force without ever having to leave the rim, and Parker and Batum should be able to run a pristine two-man game when they're not feeding Gobert, a.ka. the Stifle Tower. These are three smart players. Manu Ginobili, Luis Scola, Pablo Prigioni. It's too bad the tournament didn't take place in 2004, because this team could have been really good. Instead, they have three guys on the wrong side of 35 whose prime is well behind them. Ginobili is still fun, though, and Scola always impresses in international play. Giannis Antetokounmpo, Thanasis Antetonkounmpo, Vasillis Spanoulis. I added Greece to the field because they promise plenty of excitement. Giannis's wingspan will stretch the entire halfcourt! He gets to play with his brother, Thanasis! And Spanoulis, the Greek league mainstay, can shoot! Mostly though, I just want to see the incomparable Giannis in this format. Andrew Wiggins, Cory Joseph, Kelly Olynyk. It's really tempting to put Brady Heslip — some say the best shooter not in the NBA — on this team. But you have to think there's a reason for the "not in the NBA" part. Instead, Olynyk gets the nod over Tristan Thompson because of his ability to stretch the floor. Still, this is an offence that would rely on Wiggins, with Joseph hopefully maintaining his three-point form from this season and Olynyk annoying opponents. The U.S., and it's not close. The better question is who else lands on the podium. So who else lands on the podium? Canada, Serbia, France and Spain likely round out the top five, in some order. Serbia actually won the most recent FIBA 3x3 tournament, albeit with different players, but here they fall to second place, with Jokic named the tournament's most outstanding player. In the bronze-medal match between Canada and France, Gobert dominates in the post, while Batum shuts down Wiggins and Joseph fails to best his former mentor, Parker.